28th December 2015 was the 110th anniversary of Ken's birth. and his many devoted fans throughout the World. Ken would have been 110. He claimed that he had recorded enough tunes to last a hundred years. We are now past the half a century mark. his fans and this web site remain and also as long as people, from any generation, enjoy music and song that has real melody. Long may Ken's memory, as the old tune says 'Linger On'. arrangements, while the fourth demonstrates his later Columbia arrangement for the Hammond of Louisianna Serenade compared to the 1954 arrangement for the Wurlitzer Electrostatic organ. Chicago. It seems that Ken's 'Star' is still glowing fondly. N.B My apolgies for getting this information wrong originally. Another excellent 2 x CD collection of Ken's recordings. 62 tracks all on the Hammond Organ. From Submarine Records, 13 Gardenia Road, Bush Hill Park, Enfield, Middlesex, EN1 2JA. England, U.K.
Prices: U. K. £11.99 + £1.50 postage. Europe: 14..40 Euros + 4.40 Euros postage. With thanks to Brian Wessell who explained that he purchased the CD set via Amazon at $20 with shipping. Found this CD on Amazon.com available for pre-order––to be released April 16. Hope the transfers are good! Those I marked (???) are not in your discography or Don Boudreaux's and I am not familiar with the tuneBaby Rocks On (unless they have the wrong title for Happy Birthday Medley from Broadcast Records. Also Have You Ever Been Lonely, although I know the tune, is not in the discographies, either. Bill: I suspect that you are correct about Baby Rocks On. Happy Birthday it appeared on this page as a playable mp3 file some while back, along with another less known/used track by Ken, My Life's Story. There is nothing new in the CD set but it will be interesting hearing what the tracks sound like and whether they have received any professional remastering. 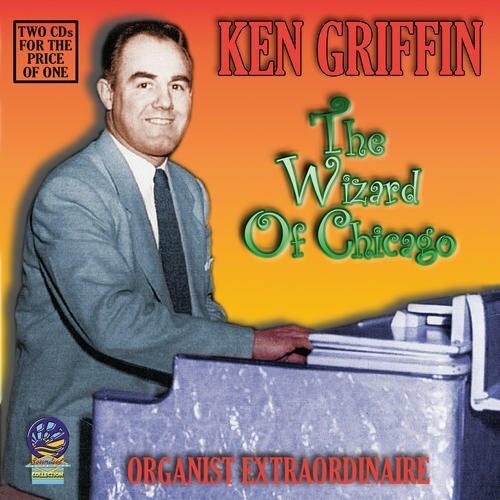 Click on this link: The Wizard Of Chicago CD Set. 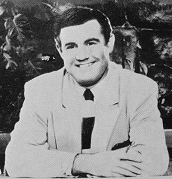 considered producing new CD's of Ken's records. Alan Ashton has a very intersting internet radio station going over at Organist's web site. It is a monthly programme changing on the 1st of each month. Alan introduces old and new recordings in a very pleasant manner and his enthusiasm and knowledge comes through. Check this month's programme out at: Organ 1st Radio Alan's July 2008 programme included two tracks from the CD Set, whicht is selling extremely well. In the September 2008 programme Alan introduced our great Ken play-a-like organist Eric Larson and played a couple of his recordings. Be sure to tune in on the 1st of each month. Click on the Organ 1st Radio link, above. "Drifting & Dreaming" REXX 334. 2 x CD by Ken will be availabe from the 22nd June 2009. Another 50 great recordings, which I am sure will contain your favourites and possibly a good few tracks that you have never heard before. Click on the photo to go to Organs.co.uk web site for full details. Price: £8.95. Skate On from Jasmines became a best selling CD's it would be nice if you can all help to possibly make this one by Rexx 334 an even bigger hit. If you only know Ken from You Can't Be True, Dear and Cuckoo Waltz, this fantastic collection will introduce you to the greater depth of Ken's playing styles and prove what a great organist and musical arranger he was. "SKATE ON" This Best Seller is still available at Jasmine's Store. Click On photo. Go to new record Company for all the latest news on what's happening in the organ world and the latest organ CD's on the market. THE HISTORICAL RECORD COMPANY Features all types of organ music, with an emphasis on recordings made on the Sanfillipo Wurlitzer Organ and their magnificently preserved Fun Fair organs. March 2019 2 X CD set "Down Melody Lane" is available from Sumarine Records. March 2019. 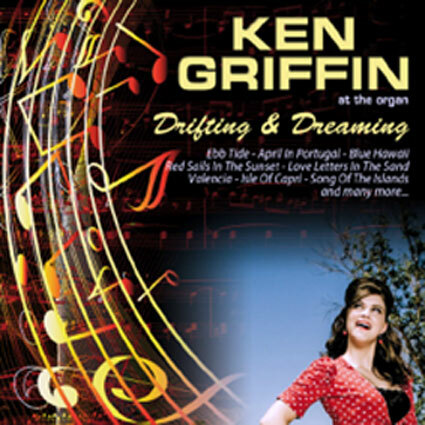 Two CD Ken Griffin collection "Down Memory Lane" from Submarine Records. 62 tracks on the Hammond Organ. 30.01.14. Six new photos of Ken added to the Home Page (Above). a number of years exchanging emails and chatting on the phone. I shall miss him and I know that his many friends will also. I have added a page by way of dedication, which you will find at page 44 on the Home Page. I will be pleased to add any comments that you or any members of his family wish to email me. 15. 02. 13. New 2-CD Set Available On Pre-Sale from Amazon. 22. 11. 11 N.B. New contact address. See bottom of page. 16. 08. 11 Royce (Doc) Brown. Bob Potts made contact with Royce and learned some news. Link 42. Ken Griffin Compositions. This mp3 page has been made permanent at link 41.
find this of interest for other Columbia artists. N.B. Link 28 is a blank link due to work not yet beings started on the Album photo collection. 4. Extended play Includes cover pictures. 10th 2005 One LP added. 12. Ken on a Pipe Organ 'resolved'! 20. 06. 04. Corrections and updated text to Johnny's information. 25.08. 08. Additional internet links added. 17. Marjorie Meinert 1921 - 2009 (Link 36). 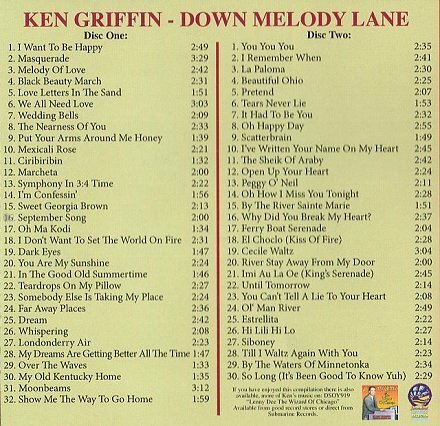 26 Ken Griffin Discography Last update 20th July 2009. 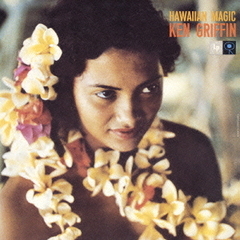 27 Ken Griffin Record Covers. 31. 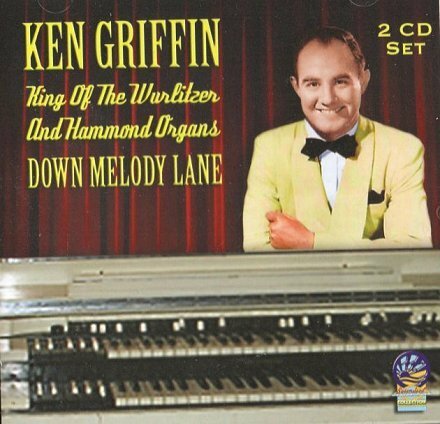 The Wurlitzer ES Organ. & URL) By Johs Wienberg-Larsen. Australian organist added. Nov. 2013. My personal web sites and pages links have been formed into one Index page where you can click on any article that may interest you.